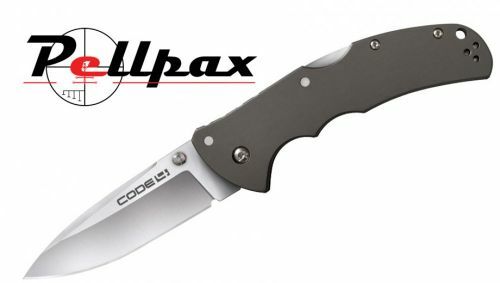 The Code-4 Spear is a trustworthy, efficient and strong tool you want with you at all times. The ambidextrous pocket/belt clip allows an easy, hand free transport. The 3 7/8" blade is crafted using AUS 8A stainless. Known for it's strength 8A is also resistant to rust due to the high amount of chromium it contains. The razor sharp blade following round to a needle point edge allowing quick and effortly penetration on materials. The blade is reinforced by it's 3.5mm thickness as well as the internal Tri-Ad lock, so during tough jobs the blade wont fail. The handle, crafted from from 5" 6061 Aluminium, offers a comfortable grip as well as a good look. Finished in a gun metal grey the handle makes this knife look very professional and will turn some heads. There are 2 grooves in the handle made to give you a natural yet controllable grip. These also prevent contact between you fingers and razor harp day. Add this item to your basket & spend an extra £382.01 to apply for finance.